The Socorro Gun Club ladies participate equally with the men in all shooting activities. 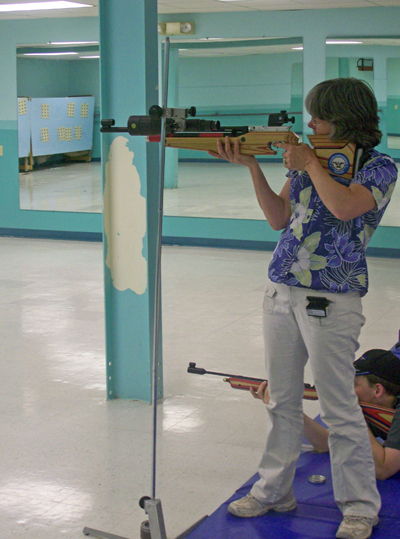 The club maybe the best non-commercial venue for women to learn safe firearms handling in a supportive and low-key environment. If you are new and interested in shooting sports or firearms for personal protection please come to a meeting or air rifle practice and jump right in - no experience necessary. Experienced shooters will enjoy the support of fellow enthusiasts while learning how to shoot centerfire rifles at CMP schools. Action Pistol events roughly follow USPSA rules without the seriousness of an actual match. Come enjoy a sport where women can compete on an equal basis with men - skill coupled with safety matter most.